The wordless love we share with pets is so powerful that it’s tempting to want to “interpret” for them. 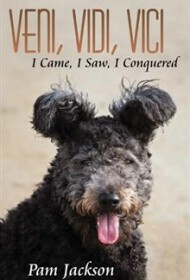 In Veni, Vidi, Vici,: I Came, I Saw, I Conquered, author and dog trainer Pam Jackson gets inside the head of a puppy she’s adopted, acting as “ghostwriter” for young Veni, a rare breed of herding dog who finds herself a long way from home. Writing from the pup’s point of view, Jackson describes Veni’s frightening trip from Italy (her full name is Venice) to life on a farm in Central California. She dislikes the family’s antique furniture and helps them out by eating as much of it as she can, disobeys trainer/mom Pam at every opportunity, and is bullied by one of the family’s dogs while trying to forge an alliance with another Pumi like herself. Anyone with a dog who has been the slightest bit mischievous will find something relatable here. Jackson writes with humor and captures Veni’s almost cat-like disdain for her enemies nicely. There are some jokes that are a bit long in the set-up phase — as when Veni is abducted by aliens who report back on her behavior — but most ultimately pay off. Segments about Jackson’s extended family are less engaging for readers outside this inner circle; if we don’t know their quirks and personalities going in, it’s hard to relate to them here. Trimming those sections a bit would give the story broader appeal. Despite these minor issues, Veni, Vidi, Vici taps into the human desire to connect with the animal world nicely. Jackson knows her subject intimately, and that comes through loud and clear in Veni’s story.